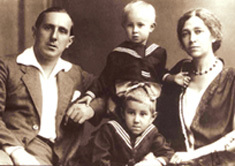 Above left: The Rostropovich family: Leopold, his wife Sofya and their children Veronika and Mstislav. All family members became distinguished musicians. Baku, 1928 or 1929. 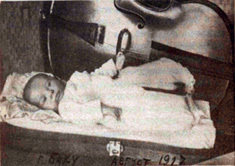 Above right: Mstislav Rostropovich as a new-born, lying in his father's cello case. Baku, 1927. 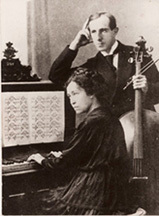 Left: Sofya and Leopold Rostropovich, parents of Slava who grew up to excel at both piano and cello. Few foreigners know that Baku is the home of a charming museum dedicated to the memory of world-renown cellist Mstislav Rostropovich (1927-2007) and his father Leopold (1891-1942). The Museum opened in 2002. The modest apartment had served as home for the family from 1925-1931, Mstislav had been born there in 1927. Father Leopold had come to Baku in 1925 upon the invitation of Uzeyir Hajibeyov (1885-1948), who as Director of the newly created Music Conservatory (1921), set out to attract as many first-class musicians and teachers as possible to Azerbaijan, especially from Russia. Leopold, a cellist, worked with him for six years. 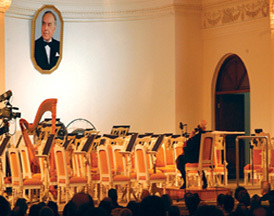 In 1997, President Heydar Aliyev invited son Mstislav back to Baku to celebrate the Maestro's 70th Birthday. The occasion rekindled a strong relationship between the famous cellist and the land of his birth. From then until his death in 2007, "Slava" (as he is affectionately called), returned five more times to give concerts, lead the symphony, and offer Master Classes. 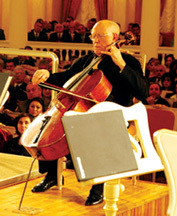 Rostropovich's 80th birthday was celebrated in Moscow on March 27, 2007. Both President Ilham Aliyev and Russia's President Vladimir Putin, awarded him their highest state medal. A month later, Rostropovich died on April 27, 2007. He is buried in Moscow. 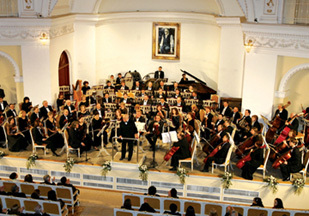 Left: Conducting Master Classes in Baku was one of the most distinguishing features of Rostropovich's visits to Baku following 1997.
the opening of the Rostropovich Home Museum. closed for several years for renovation.